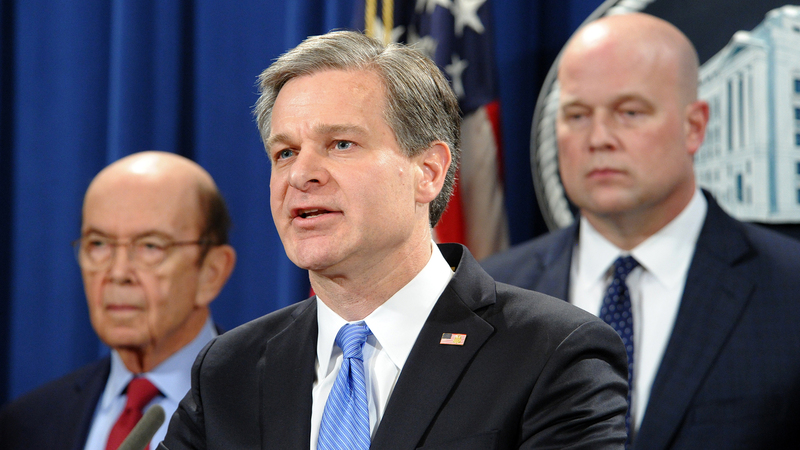 FBI Director Christopher Wray, standing with Commerce Secretary Wilbur Ross (left) and Acting Attorney General Matthew Whitaker, remarks on the charges against Huawei during a press conference today at the Department of Justice in Washington, D.C.
Chinese telecommunications equipment manufacturing giant Huawei Technologies Co., LTD has been charged with bank fraud, wire fraud, conspiracy to defraud the United States, and theft of trade secrets, among other crimes, in indictments unsealed today by United States Attorneys Offices in the Eastern District of New York and the Western District of Washington. The Eastern District of New York charged Huawei, two of its affiliates, and Chief Financial Officer Meng Wanzou with 13 counts surrounding the company’s misrepresentations to the U.S. government and four financial institutions regarding its business in Iran. The indictment charges that the company used financial institutions operating in the United States to process transactions involving millions of dollars in furtherance of Huawei’s Iran-based business. These transactions and the company’s false statements about them violated U.S. laws, including the International Emergency Economic Powers Act. The additional 10 charges out of Washington state alleged that employees at Huawei Device Co. and Huawei Device USA, Inc. worked to steal the details of an innovative and proprietary tool built by T-Mobile to test the performance of new mobile phones prior to launch. According to the indictment, Huawei employees who were granted limited access to T-Mobile’s Tappy Robot System stole information about the technology in violation of nondisclosure and confidentiality agreements, and then sought to cover up their actions. Wray expressed his gratitude to the FBI personnel who were instrumental in building the case and to partners at the Departments of Commerce and Homeland Security. He also recognized efforts by Canadian law enforcement officials. January marks National Slavery and Human Trafficking Prevention Month, but a recent case illustrates how the FBI works with partners year-round to get traffickers off the streets and help victims rebuild their lives. On the 30th anniversary of the terrorist bombing of Pan Am Flight 103 over Lockerbie, Scotland, family members and officials gathered at Arlington National Cemetery to honor the 270 victims lost in the attack.